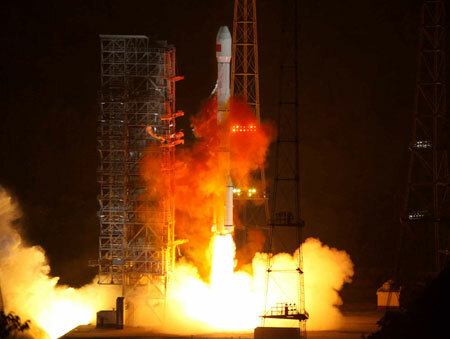 BEIJING - China lauched the country's first data relay satellite "Tianlian I" Friday night. The satellite was launched on a Long March-3C carrier rocket from the Xichang Satellite Launch Center in southwest China's Sichuan Province at 11:35 p.m. (Beijing Time). The satellite will not go into function though untill the Shenzhou VII mission scheduled for the second half of 2008. Developed by China Aerospace Science and Technology Corporation, the satellite is the country's first ever data relay satellite. It will increase the time Shenzhou VII spaceship in communication with the ground, and improve the amount of data that can be transferred, according to Zhang Jianqi, top official with China's space programs. "The Yuanwang space tracking ships along with China's over ten ground observation stations can only cover 12 percent of Shenzhou VII spaceship's orbit in the space," Zhang said. The "Tianlian I" satellite alone, according to Zhang, can cover 50 percent of the orbit of Shenzhou VII, or any other China's spacecrafts. With the help of the satellite, scientists can get more scientific data collected by our satallites without delay, and can know earlier when a malfunction is taking place in China's spacecrafts, said Zhang. The launch is the 105th mission of China's Long March series of rockets, and the first mission of the Long March-3C carrier rocket. The 55-meter carrier rocket with two boosters is capable of lanuching satellites weighed between 2,600 kilograms to 3,800 kilograms into the space. A total of seven Long March-3C carrier rockets are now in production, and will carry "several domestic and foreign satellites" to the space, said Chen Minkang, chief designer of the rocket, without further details. China had planned 10 space launches this year including the Shenzhou VII spaceship. The Shenzhou VII will be launched from the Jiuquan Satellite Launch Center in the northwestern province of Gansu late in the year and the astronauts will leave their spacecraft for the first time. China began its manned space program in 1999. It successfully sent Yang Liwei into orbit on the Shenzhou V spacecraft in 2003. Two years later, Fei Junlong and Nie Haisheng completed a Chinese record of five-day flight on the Shenzhou VI. All returned safely.